An update to the Apple Store iOS app is supposedly on the way, with two major features in tow: in-store pick up, and self check-out. It was just the other day we heard rumblings about Apple offering online ordering with retail store pick up. In fact, the feature has already rolled out to a few California and New York City locations, with more stores ready to go live on Thursday in conjunction with the app, according to BGR. Once the update hits, the app will function as you'd expect: A customer who orders a product online will have the option to pick it up in-store only twelve minutes after completing the order. Apparently it's all the time Apple needs for the order to go through the proper channels. Apple says that after the twelve minutes are up, customers can simply walk into the store, sign for their purchase, and walk out. Lines, crowds and cash registers will be a thing of the past. Items not in-stock, like a custom-configured machine, will be given a later pick-up date. There will be no shipping costs involved, and once the order arrives at an Apple store, customers will get a push notification alerting them that their purchase is ready for pick-up. The same twelve minute timeframe will supposedly apply: get the notification, and twelve minutes later you can pick up your order. Apple execs are said to be excited about the in-store pickup option and expect consumers to adopt it as their method of choice going forward. In addition, it should offer a more pleasant experience regarding daily foot traffic, and even save Apple on shipping costs. A biggie from Apple's new retail plan may even see newly created job opportunities. Items delivered to stores from online purchases will receive revenue credit, and Apple expects the new program to increase sales by as much as 30%. The second, more intriguing feature said to be hitting the new update will allow customers to perform self check-out at retail stores. 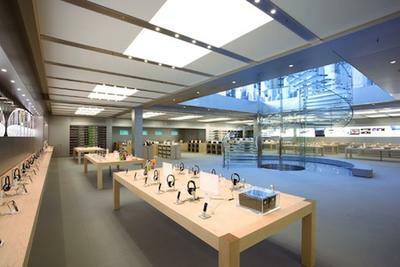 If the feature comes together, consumers will be able to launch the Apple Store app and buy the item in-store by scanning the product with their iDevice's camera. So if I were to purchase something, the credit card associated with my Apple ID would be charged, and I'd be on my way. It will be interesting to see how the new plans affect retail traffic in Apple stores and overall sales, especially with the holiday season fast approaching. It certainly makes things much easier for consumers, and will hopefully eliminate the chaos that ensues during this time of year. What do you think of Apple's plans?